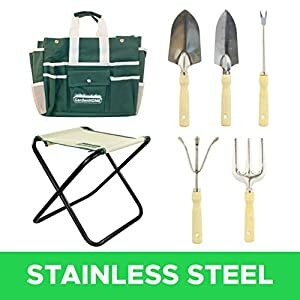 ★LIGHTWEIGHT AND PORTABLE: All-in-one Garden Tool Set is not only sturdy but also much more lightweight comparing to our competitors. Designed to serve the purpose of portability and durability under all weather conditions. ★STAINLESS STEEL TOOLS WITH WOODEN HANDLES: All tools have stainless steel heads with wood handles and holes for convenient storage and higher durability level. Great tools to make gardening tasks much easier. ★STURDY STEEL FRAME STOOL: Steel frame with strong polyester canvas, the top-quality folding stool makes your gardening more comfortable and less tiring. 345 queries in 1.193 seconds.